Background and Aim: Recurrent hemarthrosis results in synovitis and destructive arthropathy in hemophilic patients. The aim of our study was to investigate the efficacy and synovial changes with viscosupplementation therapy in treating hemophilic arthropathy of the knee. Subjects and Methods: Twenty hemophilic patients who had painful arthropathy of the knee with synovitis were enrolled. Patients received three weekly intra-articular injections of 2 mL hyaluronic acid (HA). The synovial thickness and vascularity determined by ultrasonography, visual analog scale (VAS), Western Ontario and McMaster Universities Osteoarthritis Index (WOMAC), and Short Form 36 (SF-36) were compared initially and at 1, 2, 3, and 6 months after the first injection. Statistical analysis was performed using SPSS version 20 software (Armonk, NY, USA: IBM Corp). Results: There were 19 hemophilia A patients and 1 hemophilia B patient. A total of 26 knees received viscosupplementation therapy. Significant improvement in VAS, SF-36, WOMAC score, hyperemia, and thickness of suprapatellar recess synovium from baseline was seen up to 6 months after intra-articular HA injection. No severe injection-related adverse event was observed. Conclusions: This study suggests that three weekly intra-articular HA injections are safe and effective in treating hemophilic arthropathy of knee with synovitis for a period up to 6 months. The treatment not only improved quality of life, pain and knee function but also reduced synovial thickness and hyperemia. HA viscosupplementation therapy could serve as an adjunctive therapy before arthroscopic synovectomy or total knee arthroplasty. Hemophilia is an X-linked recessive bleeding disorder caused by a deficiency of coagulation factor VIII (hemophilia A) or IX (hemophilia B). Hemophilia affects 1 in 5000 male births. The classification of severity was determined by measuring factor clotting activity level (<1%, severe; 1%–5%, moderate; 5%–30%, and mild). Severe hemophilia patients may have frequent spontaneous bleeding episodes such as joint and muscle bleeding, but mild hemophilia patients only have bleeding episodes after trauma, surgery, or tooth extraction. More than 60% of bleeds occurring into joints in severe hemophilia. Repeated joint bleeding leads to chronic synovitis, cartilage damage and bony destruction, which is associated with the limitation of range of motion (ROM), pain, muscle atrophy, functional impairment and poor quality of life. Around 80% of all spontaneous joint bleeds occur in the ankles, knees, and elbows. Prophylactic replacement, physical therapy, COX2 inhibitors, corticosteroids, radionucleotide synovectomy, and joint arthroplasties are some of the typical modalities used in the managements hemophilic synovitis and arthropathy. The onset of joint bleedings in severe hemophilia occurs approximately 2 years of age and arthropathy could be worsening in adolescents or young adults. Some hemophilia patients may either not be good candidates for surgery or may not prefer to have surgery. Hyaluronic acid (HA) has been shown to be safe and effective for the treatment of pain associated with mild-to-moderate osteoarthritis since 1989. The research investigating the therapeutic effect of HA in patients with hemophilic arthropathy is rare because bleeding tendency is concerned, and hemophilic arthropathy is often severe and troublesome. Fernández-Palazzi et al. first used intra-articular HA injection for hemophiliacs with arthropathy since 1994 and reported its good response in 2002. Following two studies also showed a similar result., However, the definite effect of intra-articular HA injection for hemophilic arthropathy of the knee in current published studies are insufficiently proved because they enrolled small patient numbers and lack of controlled group. Moreover, all the measured outcomes of above-mentioned studies are all based on patients' subjective symptom, functional activity or working condition, and no objective measurement such as synovial thickness and vascularity by image study, the intervention-related bias wound overstate its clinical effect. For knee imaging, magnetic resonance imaging (MRI) and ultrasonography (USG) are more sensitive tools than conventional radiography for determining the involvement of the synovium, effusion, bursa, cartilage, tendons, and ligaments. USG is useful in detecting joint bleeds, synovial hyperplasia, and joint erosion in hemophilic arthropathy, with efficacy comparable to those of MRI. With the advancement of USG techniques, such as Power Doppler, it appears that this modality can provide the detailed assessment of vascularity and disease activity., The use of MRI is limited by its lack of widespread availability and high cost, and it is also unsuitable for nonsedated pediatric patients or claustrophobic adults. Thereafter, musculoskeletal USG has been coming a very useful complementary tool for the detection of hemophilic arthropathy or synovitis because of its good performance in detecting synovial hypertrophy and hyperemia, cartilage change, joint effusion, and bony destruction. It may provide a viable alternative to MRI, especially in settings where the latter, is not readily available or where there is a need for frequent assessments for close monitoring. The aims of the study were (1) to investigate the efficacy, safety and effective duration of three weekly intra-articular injections of HA in patients with hemophilic arthropathy of knee (2) to evaluate changes in synovial thickness and vascularity by USG after intra-articular HA injection. The study was approved by the Institutional Review Board of our institution (No. 099--05-152), and all the enrolled patients provided their written informed consents that fully disclosed the risks and benefits of study participation. A total of 61 hemophilia patients with hemophilic arthropathy of knee joints were managed at our hemophilia center. Twenty-four of the 61 patients (39%) who were found to have painful (visual analog scale [VAS] ≥5) hemophilic arthropathy for at least 6 months and had no significant response to conservative treatment (including medication with analgesic or anti-inflammatory agents and physical therapy) were screened for this study. Synovial hypertrophy was determined by USG, and the thickness of the synovium had to be more than 2 mm for inclusion in the study. The exclusion criteria were as follows: the presence of joint infections, any surgery on the knee joint in preceding 12 months, intra-articular corticosteroid or HA injection within the past 6 months, treatment with systemic steroids, history of rheumatoid arthritis, or gouty arthropathy, history of chicken or egg allergy, presence of neoplasm, acute hemarthrosis, paresis, or recent trauma. Based on the above-mentioned criteria, four patients were excluded, including two patients with previous surgeries and the other two with synovial thickness of <2 mm. Therefore, 20 patients were eventually enrolled in this study. We collected clinically relevant information including age, gender, body mass index (BMI), hemophilia type, disease severity, inhibitor titre, and the average number of joint bleeds per month. Patients received three weekly intra-articular injections of 2 mL of sodium hyaluronate (Hyalgan, Fidia Farmaceutici S. p. A., Abano Terme, Italy) with prophylactic factor replacement before each injection to prevent joint bleeding. Before starting this course of treatment, a baseline USG evaluation was performed. Before injection, the hemophilia patients received 25 IU/kg factor replacement therapy to protect them from hemarthrosis. After injection, the joint was rested for 20 min, and the compression was applied with an elastic bandage to minimize any injection-related bleeding. All outcome measurements were performed initially at baseline and at 1, 2, 3, and 6 months after the first injection. The primary outcome measure was the reduction of pain intensity measured by the VAS, whose scale ranged from 0 (no pain) to 10 (extremely severe pain). Secondary clinical outcome measures included synovial thickness by USG, hyperemia by Power Doppler, ROM, Western Ontario and McMaster Universities Osteoarthritis Index (WOMAC) and Short Form 36 (SF-36). The patients self-administer clotting factor for perceived knee joint bleeds were based on their own judgment. The only investigator supplied paracetamol was allowed for additional pain relief. The administration of analgesic, joint bleeding episodes, and adverse events during the study was also recorded in diary by the patients themselves. The USG assessment was performed according to a standard technique using Terason t3000 machines (Teratech™, Burlington, Massachusetts, USA) with a 5–12 MHz linear transducer. The probe scanned the joint in the longitudinal view with the knee in full extension [Figure 1]. 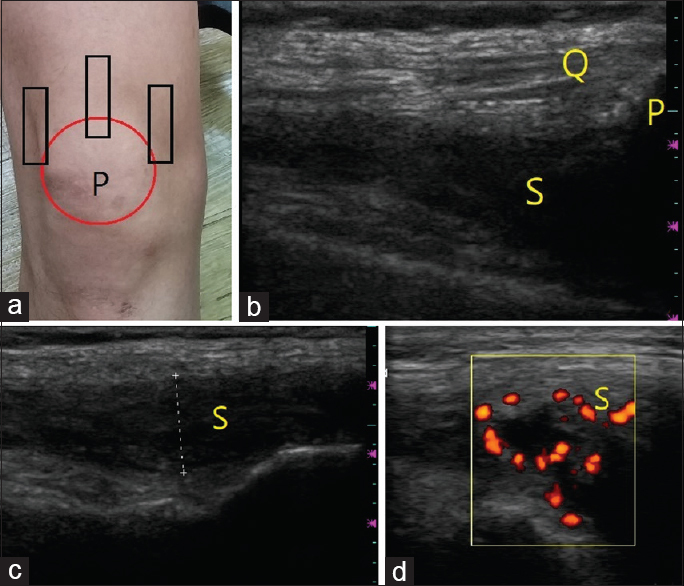 Synovium thickness and hyperemia were evaluated from the lateral, middle, and medial aspects of the anterior suprapatellar recess., Power Doppler assessment of selected synovial sites was carried out with settings standardized to a pulse repetition frequency of 700 Hz. The power Doppler gain was adjusted to a level just below the disappearance of artifacts under the bony cortex., The intensity of the blood flow in the synovium was scored into 0–3 (0 = No flag; 1 = 1 flag; 2 = 2–3 flags; 3 ≥flags) adapted from Klukowska et al. and Melchiorre et al., Averages of synovium thickness and score of hyperemia in lateral, middle, and medial aspects of the anterior suprapatellar recess were calculated. Anteroposterior and lateral plain radiographs of knees were performed and scored according to Pettersson classification by the designated orthopedic specialist at our hemophilia center. The Pettersson score ranges from 0 to 13 and is based on the following radiographic features of joints: osteoporosis, osteophytes, narrowing of joint space, subchondral irregularity, subchondral cyst formation, erosion of joint margins, and bone remodeling. A totally normal joint has a score of zero. This Pettersson scoring system has been adopted by the World Federation of Haemophilia as the preferred radiographic classification system for hemophilic arthropathy. ROM of the knee was measured in degrees with a goniometer according to the American Academy of Orthopaedic Surgeons guidelines. All ROM measurements were performed by the same assessor. The pain intensity of knee was evaluated subjectively on a VAS (0–10 cm). The SF-36 is a generic measure of health status and has gained popularity as a measure of outcome in a wide variety of patient groups and surveys. The SF-36 is a 36-item assessment tool that measures eight general health concepts including physical functioning, role limitation due to physical health problems, bodily pain, general health, vitality, social functioning, role limitation due to emotional problems, and mental health. The SF-36 is filled out taking into account the person's condition in the last 1 month, and scores range from 0 to 100, with higher scores indicating better health-related quality of life. The WOMAC index was developed in the early 1980s as a disease-specific measure for lower limb arthritis and arthropathy. It consists of 24 items: five pertaining to pain, two to stiffness, and 17 to physical function. We used 100 mm VAS formats. Individual question scores were then added up to form a raw score ranging from 0 (best) to 2400 (worst). Finally, raw scores were normalized by multiplying each score by 100/2400. This produces a reported WOMAC Score of between 0 (best) to 100 (worst). Continuous variables were expressed as mean values and standard deviations. The repeated measures analysis of variance was used to test for significant difference between baseline and various follow-up measures. P < 0.05 was considered statistically significant. Statistical analysis was performed using SPSS version 20 software (Armonk, NY, USA, IBM Corp.). A total of 20 patients were studied of whom 19 had hemophilia A and 1 had hemophilia B. Their demographic data are listed in [Table 1]. The median age was 38.2 ± 10.1 years (range, 15–49 years). Sixteen patients had severe hemophilia, whereas four had moderate type of hemophilia. Two patients had factor VIII inhibitors and three had HIV. The mean BMI was 24.2 ± 4.7 kg/m (range, 19.1–40.3). 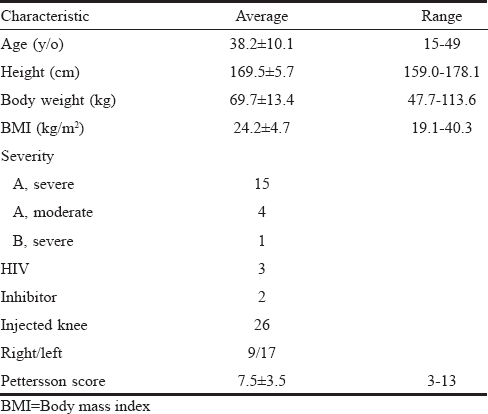 Twenty-six (17 left and 9 right) knee joints were treated with intraarticular viscosupplementation therapy with 7.5 ± 3.5 (range, 3–13) averaged Pettersson score before injection, as shown in [Table 1]. Changes from baseline in the VAS, SF-36, WOMAC, ROM, hemarthrosis, hyperemia and synovial thickness to those at 1, 2, 3, and 6 months after first HA injection are shown in [Table 2]. All of these variables except ROM were significantly improved after HA treatment as summarized below. 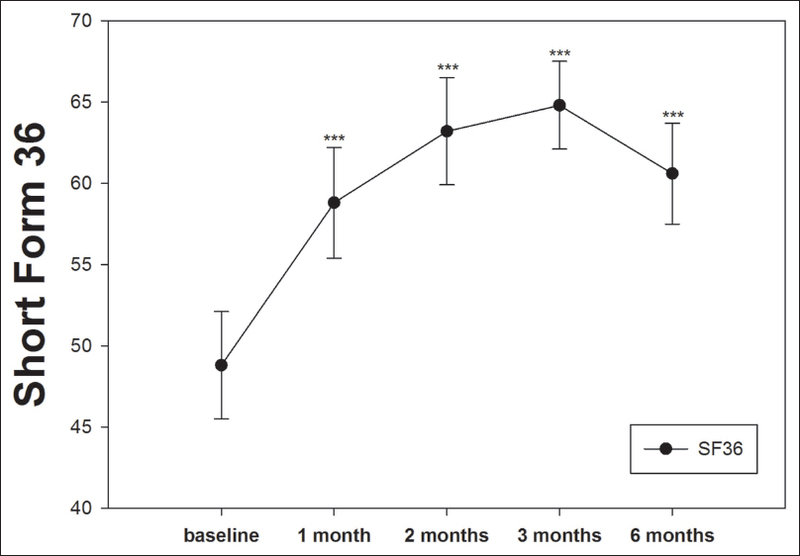 A significant reduction in pain from hemophilic arthropathy of knee was observed up to 6 months (F = 35.32, P < 0.01), with the maximal benefit being noted at 2 months after HA injection [Figure 2]. 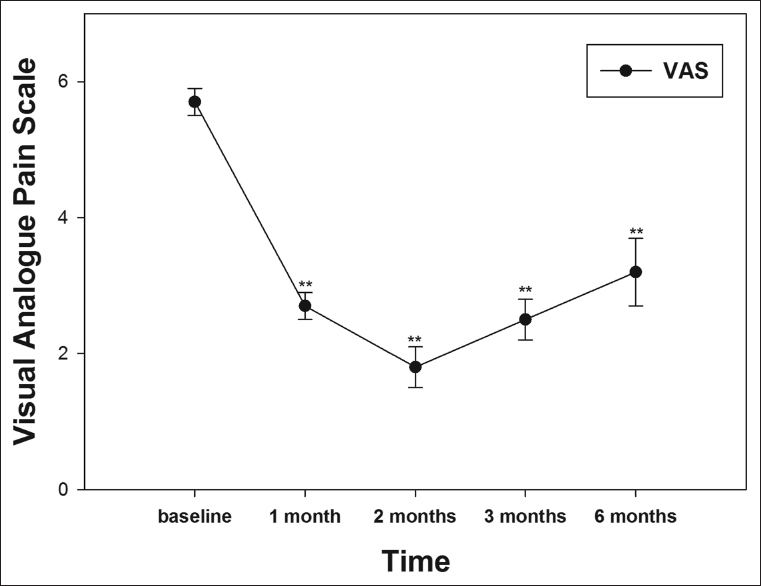 The SF-36 score was significantly increased for 6 months after HA viscosupplementation (F = 17.12, P < 0.01), and this score reached the highest level at 3 months after treatment [Figure 3]. 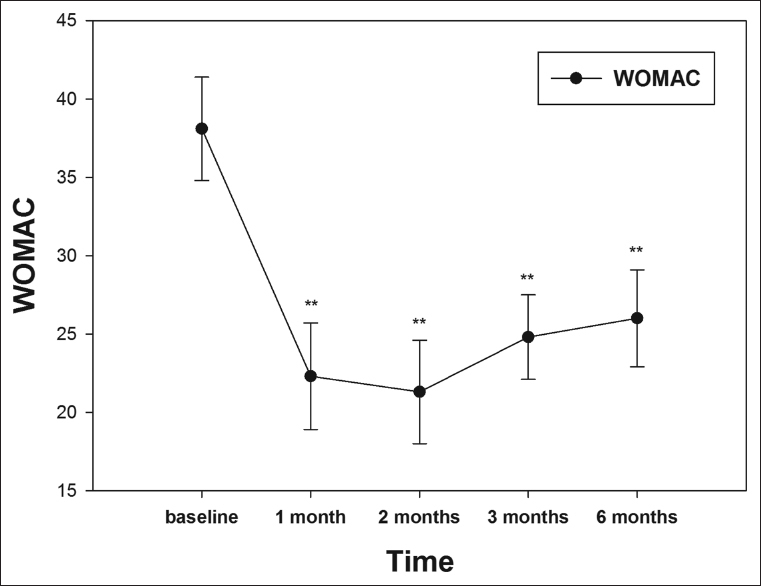 WOMAC score was significantly improved for 6 months after HA viscosupplementation injection (F = 13.79, P< 0.01), and which was the lowest at the second month of follow-up [Figure 4]. HA viscosupplementation significantly reduced the thickness of suprapatellar synovium (F = 7.18, P < 0.05) and those reduction was obviously at the 2 months and 3 months, as shown in [Table 2]. Moreover, a significant improvement in synovial hyperemia was also achieved (F = 4.09, P < 0.05), as shown in [Table 2]. The average number of monthly joint bleeds was decreased after HA treatment (F = 16.73, P < 0.01), as listed in [Table 2]. There was no bleeding in 10 knee joints (38.5%) for 6 months after HA treatment. In this study, all patients completed the 3 consecutively weekly intra-articular HA injections with good tolerance. Most adverse events were minor and transient and occurred at the injection site. Postinjection soreness occurred in two patients, and injection site ecchymosis was noted in three patients. There was no HA injection-related joint bleeding, infection, or acute inflammation. To the best of our knowledge, the present study is the first research to evaluate synovial thickness and hyperemia by the use of USG as therapeutic measurements in patients with hemophilic arthropathy after intra-articular HA injection. The result demonstrates that the efficacy and safety of intra-articular HA injection including pain relief, subsided synovitis, increase quality of life, enhance knee joint function, and reduced joint bleeding events at least 6 months after the first injection. Hemophilic arthropathy is a multifactorial event and there is evidence that iron may play a major role with release of cytokines such as interleukin (IL)-1, IL-6, and tumor necrosis factor-alpha (TNF-α) leading to chronic proliferative synovitis, hypervascularity, cartilage damage, and bone destruction. Comer et al. reported that HA suppressed production of TNF-α and Takahashi et al. found HA reduced expression of IL-1. Such evidence suggested that intra-articular HA may inhibit these inflammatory cytokines, then beneficial in the treatment of haemophilic arthropathy with synovitis. Fernández-Palazzi et al. were the pioneers in using intra-articular HA injection for hemophilic patients since 1994 and reported its good efficacy and safety in treating haemophilic arthropathy in 2002. Wallny et al. reported that 14 of 20 hemophilia patients had improvement in knee pain, World Federation of Hemophilia score, and walking distance after 5 consecutive weekly intra-articular injections without obvious change of MRI between baseline and 3 months after first injection of HA. Moreover, all patients had no major complications at 2 years of follow-up. 9 Recently, Carulli et al. reported 27 hemophilic patients with a mean 7-year follow-up who had excellent results regarding pain relief and functional improvement in knees following treatment with HA injection, particularly at 6 months follow-up. 10 Our study supports these previous claims of a benefit of intra-articular HA injection in patients with hemophilic arthropathy during 6 months of follow–up especially at the 2– 3-month time points after treatment. Furthermore, we first identified the significant decrease of synovium thickness and synovial hyperemia after intra-articular HA injection. [Table 3] illustrates the comparison between our study and other three published from studies. USG examination, which is convenient, inexpensive, and readily available, has been primarily recommended for the diagnosis of inflammatory arthritis, and arthropathy involving the synovial fluid, synovium, and articular cartilage. With advancements in USG technique, such as Power Doppler, it appears that this modality can provide more detailed assessment of vascularity and disease activity.,, Doppler sonography has been shown to provide USG measure of synovial vascularity in hemophilic joints that is very comparable to dynamic contrast-enhanced MRI. Finally, systematic protocols for USG image acquisition as well as USG scale for evaluation of hemophilic joints,, have been developed, which should enable a more standardized clinical application on a broader scale in the near future. In this study, synovial thickness and hyperemia of knee joints were measured by USG and a statistically significant reduction in both with this treatment was demonstrated. This may be related to anti-inflammatory effects of HA. We also found reduced frequency of joint bleeds after HA injection. Supplementation of HA by increasing joint lubrication and decreasing joint shearing force, may reduce the friction of synovium and frequency of hemarthrosis, and may even block the vicious cycle of hemarthrosis-synovitis-hemarthrosis. With regard to safety of HA injection, three cases of injection sites ecchymoses were noted in our study when a 23 G injection needle was used. After changing to a 25G needle, however, there were no such events. No serious adverse effect was noted in this study. Both Fernández-Palazzi et al. and Wallny et al. reported no major complications in their studies although Athanassiou-Metaxa et al. reported an 8-year-old boy who received intra-articular HA knee injection but had the treatment interruption due to hemarthrosis. There was no treatment interruption due to hemarthrosis in our study. There are some limitations to this study. The main limitation was the small samples size and absence of a control group. Although a larger series with randomized controlled trial may help further verify the efficacy of intra-articular HA injection for hemophilic arthropathy of knee, the hemophilia is an uncommon condition and injection of saline as placebo into the knee joint of a hemophilia patient would not be ethically justifiable. Moreover, treatment bias can hardly explain the significant 6-months effect and decreased synovium thickness and hyperemia which were subjectively measured by USG in patients with recalcitrant hemophilic arthropathy. The limitation of the lack of control group in our study could be ignored mostly. Finally, we did not investigate the long-term effect beyond the 6th months. Nevertheless, the significant difference in all measurements except ROM compared with baseline until the 6th months [Table 2] imply that the therapeutic effect may extend beyond the follow-up period examined in this study. This study has shown that three consecutive weekly intra-articular HA (Hyalgan) injections were safe and effective in treating recalcitrant hemophilic arthropathy of knee with synovitis for a period of up to 6 months and can improve quality of life, pain, synovium thickness, and knee function in such patients. HA viscosupplementation therapy could, therefore, be an option in case of failure of factor prophylaxis therapy and as an alternative to certain other joint directed therapies such as radiosynovectomy. Finally, it may also serve as a temporizing measure before arthroscopic synovectomy and total knee arthroplasty. This study was supported by a research grant, TSGH-C100-119 from the Tri-Service General Hospital. The authors extend their thanks to Dr. Vivek R. Sharma, research scientist and medical director, adult hemophilia program, division of medical oncology/hematology, University of Louisville, School of Medicine for his thoughtful review of this manuscript and Nurses Hsiao-Chung Lee and Ya-Wen Chen for their excellent care of our hemophilia patients and coordination of this study. This study was financially supported by Grant, TSGH-C100-119 from the Tri-Service General Hospital, Taipei, Taiwan. Stephensen D, Tait RC, Brodie N, Collins P, Cheal R, Keeling D, et al. Changing patterns of bleeding in patients with severe haemophilia A. Haemophilia 2009;15:1210-4. Krasuska M, Riva S, Fava L, von Mackensen S, Bullinger M. Linking quality-of-life measures using the international classification of functioning, disability and health and the international classification of functioning, disability and health-children and youth version in chronic health conditions: The example of young people with hemophilia. Am J Phys Med Rehabil 2012;91:S74-83. Rattray B, Nugent DJ, Young G. Celecoxib in the treatment of haemophilic synovitis, target joints, and pain in adults and children with haemophilia. Haemophilia 2006;12:514-7. Rivard GE, Girard M, Bélanger R, Jutras M, Guay JP, Marton D, et al. Synoviorthesis with colloidal 32P chromic phosphate for the treatment of hemophilic arthropathy. J Bone Joint Surg Am 1994;76:482-8. Westberg M, Paus AC, Holme PA, Tjønnfjord GE. Haemophilic arthropathy: Long-term outcomes in 107 primary total knee arthroplasties. Knee 2014;21:147-50. Pollmann H, Richter H, Ringkamp H, Jürgens H. When are children diagnosed as having severe haemophilia and when do they start to bleed? A 10-year single-centre PUP study. Eur J Pediatr 1999;158 Suppl 3:S166-70. Clarke S, Lock V, Duddy J, Sharif M, Newman JH, Kirwan JR, et al. Intra-articular hylan G-F 20 (Synvisc) in the management of patellofemoral osteoarthritis of the knee (POAK). Knee 2005;12:57-62. Fernández-Palazzi F, Viso R, Boadas A, Ruiz-Sáez A, Caviglia H, De Bosch NB, et al. Intra-articular hyaluronic acid in the treatment of haemophilic chronic arthropathy. Haemophilia 2002;8:375-81. Wallny T, Brackmann HH, Semper H, Schumpe G, Effenberger W, Hess L, et al. Intra-articular hyaluronic acid in the treatment of haemophilic arthropathy of the knee. Clinical, radiological and sonographical assessment. Haemophilia 2000;6:566-70. Carulli C, Matassi F, Civinini R, Morfini M, Tani M, Innocenti M, et al. Intra-articular injections of hyaluronic acid induce positive clinical effects in knees of patients affected by haemophilic arthropathy. Knee 2013;20:36-9. Sierra Aisa C, Lucía Cuesta JF, Rubio Martínez A, Fernández Mosteirín N, Iborra Muñoz A, Abío Calvete M, et al. Comparison of ultrasound and magnetic resonance imaging for diagnosis and follow-up of joint lesions in patients with haemophilia. Haemophilia 2014;20:e51-7. Cyteval C. Doppler ultrasonography and dynamic magnetic resonance imaging for assessment of synovitis in the hand and wrist of patients with rheumatoid arthritis. Semin Musculoskelet Radiol 2009;13:66-73. Acharya SS, Schloss R, Dyke JP, Mintz DN, Christos P, DiMichele DM, et al. Power doppler sonography in the diagnosis of hemophilic synovitis – A promising tool. J Thromb Haemost 2008;6:2055-61. Zukotynski K, Jarrin J, Babyn PS, Carcao M, Pazmino-Canizares J, Stain AM, et al. Sonography for assessment of haemophilic arthropathy in children: A systematic protocol. Haemophilia 2007;13:293-304. Hermann G, Gilbert MS, Abdelwahab IF. Hemophilia: Evaluation of musculoskeletal involvement with CT, sonography, and MR imaging. AJR Am J Roentgenol 1992;158:119-23. Melchiorre D, Linari S, Innocenti M, Biscoglio I, Toigo M, Cerinic MM, et al. Ultrasound detects joint damage and bleeding in haemophilic arthropathy: A proposal of a score. Haemophilia 2011;17:112-7. Chen YC, Chen LC, Cheng SN, Pan RY, Chang ST, Li TY, et al. Hemophilic arthropathy of shoulder joints: Clinical, radiographic, and ultrasonographic characteristics of seventy patients. J Bone Joint Surg Am 2013;95:e43. Klukowska A, Czyrny Z, Laguna P, Brzewski M, Serafin-Krol MA, Rokicka-Milewska R, et al. Correlation between clinical, radiological and ultrasonographical image of knee joints in children with haemophilia. Haemophilia 2001;7:286-92. Pettersson H, Ahlberg A, Nilsson IM. A radiologic classification of hemophilic arthropathy. Clin Orthop Relat Res 1980;149:153-9. Brazier JE, Harper R, Jones NM, O'Cathain A, Thomas KJ, Usherwood T, et al. Validating the SF-36 health survey questionnaire: New outcome measure for primary care. BMJ 1992;305:160-4. Martin DP, Engelberg R, Agel J, Swiontkowski MF. Comparison of the musculoskeletal function assessment questionnaire with the short form-36, the Western Ontario and McMaster universities osteoarthritis index, and the sickness impact profile health-status measures. J Bone Joint Surg Am 1997;79:1323-35. Lafeber FP, Miossec P, Valentino LA. Physiopathology of haemophilic arthropathy. Haemophilia 2008;14 Suppl 4:3-9. Comer JS, Kincaid SA, Baird AN, Kammermann JR, Hanson RR Jr., Ogawa Y, et al. Immunolocalization of stromelysin, tumor necrosis factor (TNF) alpha, and TNF receptors in atrophied canine articular cartilage treated with hyaluronic acid and transforming growth factor beta. Am J Vet Res 1996;57:1488-96. Takahashi K, Goomer RS, Harwood F, Kubo T, Hirasawa Y, Amiel D, et al. The effects of hyaluronan on matrix metalloproteinase-3 (MMP-3), interleukin-1beta (IL-1beta), and tissue inhibitor of metalloproteinase-1 (TIMP-1) gene expression during the development of osteoarthritis. Osteoarthritis Cartilage 1999;7:182-90. Wakefield RJ, Kong KO, Conaghan PG, Brown AK, O'Connor PJ, Emery P, et al. The role of ultrasonography and magnetic resonance imaging in early rheumatoid arthritis. Clin Exp Rheumatol 2003;21:S42-9. Wakefield RJ, Balint PV, Szkudlarek M, Filippucci E, Backhaus M, D'Agostino MA, et al. Musculoskeletal ultrasound including definitions for ultrasonographic pathology. J Rheumatol 2005;32:2485-7. Stegbauer J, Rump LC, Weiner SM. Sites of inflammation in painful rheumatoid shoulder assessed by musculoskeletal ultrasound and power Doppler sonography. Rheumatol Int 2008;28:459-65. Terslev L, Torp-Pedersen S, Savnik A, von der Recke P, Qvistgaard E, Danneskiold-Samsøe B, et al. Doppler ultrasound and magnetic resonance imaging of synovial inflammation of the hand in rheumatoid arthritis: A comparative study. Arthritis Rheum 2003;48:2434-41. Muca-Perja M, Riva S, Grochowska B, Mangiafico L, Mago D, Gringeri A. Ultrasonography of haemophilic arthropathy. Haemophilia 2012;18:364-8. Mori S, Naito M, Moriyama S. Highly viscous sodium hyaluronate and joint lubrication. Int Orthop 2002;26:116-21. Wong BL, Kim SH, Antonacci JM, McIlwraith CW, Sah RL. Cartilage shear dynamics during tibio-femoral articulation: Effect of acute joint injury and tribosupplementation on synovial fluid lubrication. Osteoarthritis Cartilage 2010;18:464-71. Athanassiou-Metaxa M, Koussi A, Economou M, Tsagias I, Badouraki M, Trachana M, et al. Chemical synoviorthesis with rifampicine and hyaluronic acid in haemophilic children. Haemophilia 2002;8:815-6.